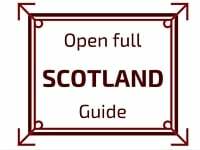 IT is normally opened between May and September but may be closed if weather makes the visit dangerous. 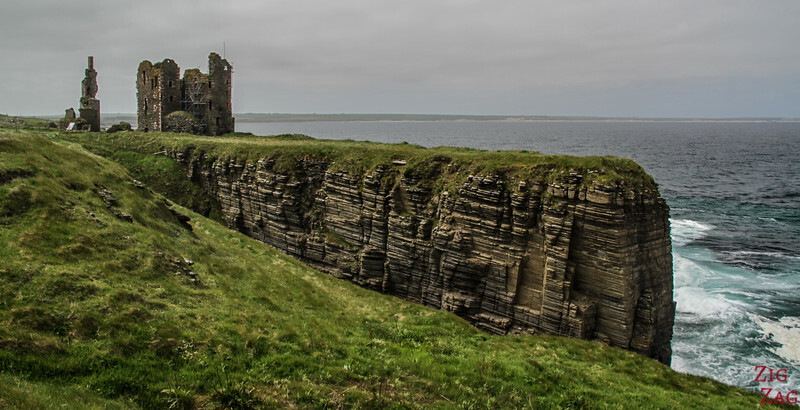 THe Sinclair Girnigoe Castle is located on Noss Head. 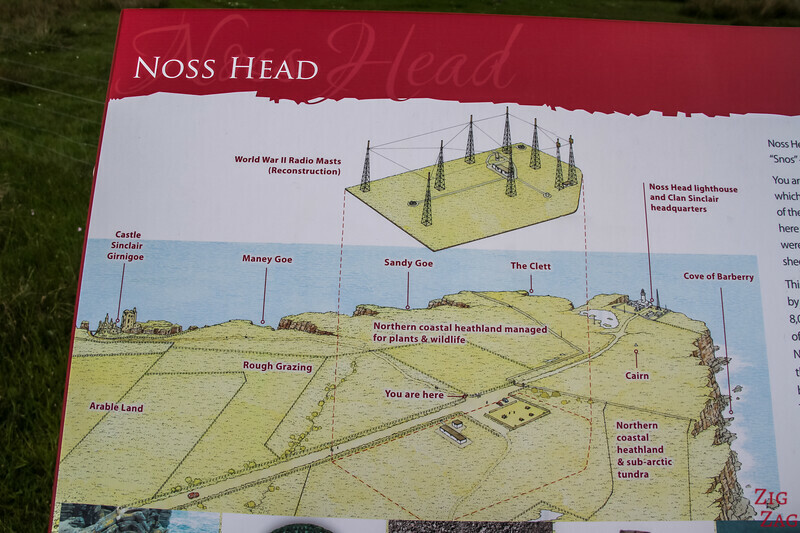 The Road leads you to the Noss Head lighthouse that you can see on the picture below. You can park on the right. 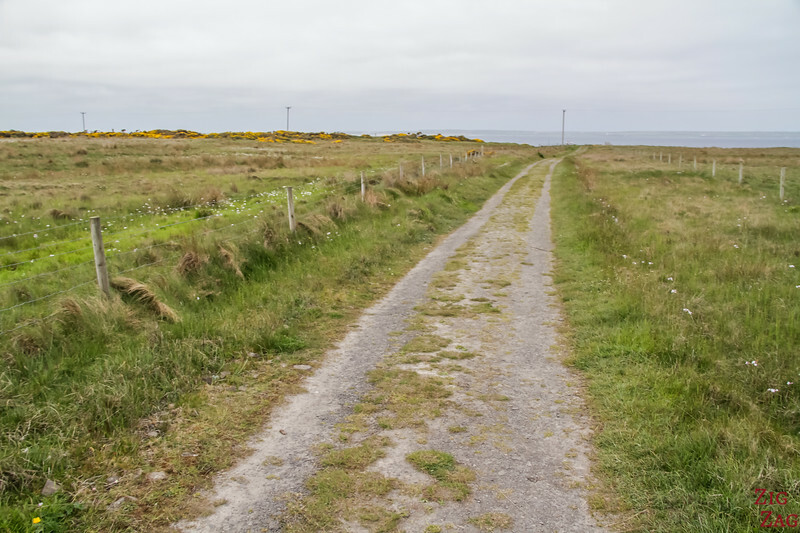 On the left is the beginning of a track with many signs containing a lot of information about the Girnigoe Castle History and architecture. 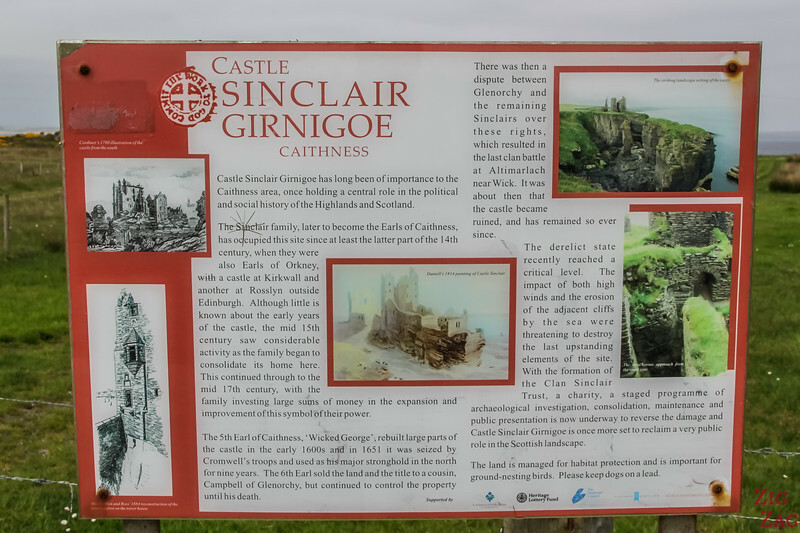 The Clan Sinclair has occupied this site since at least the late 14th century.​ Not much is known about the early years of the castle. 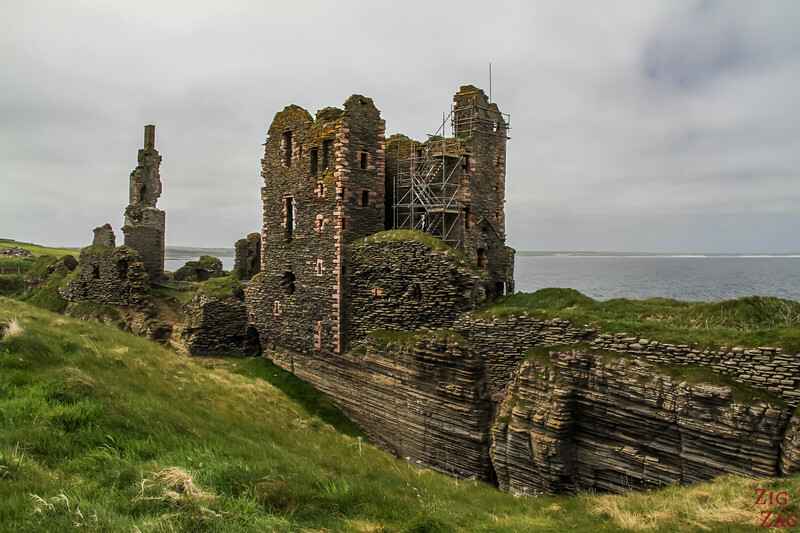 In the 17th century a lot of the castle was rebuilt. 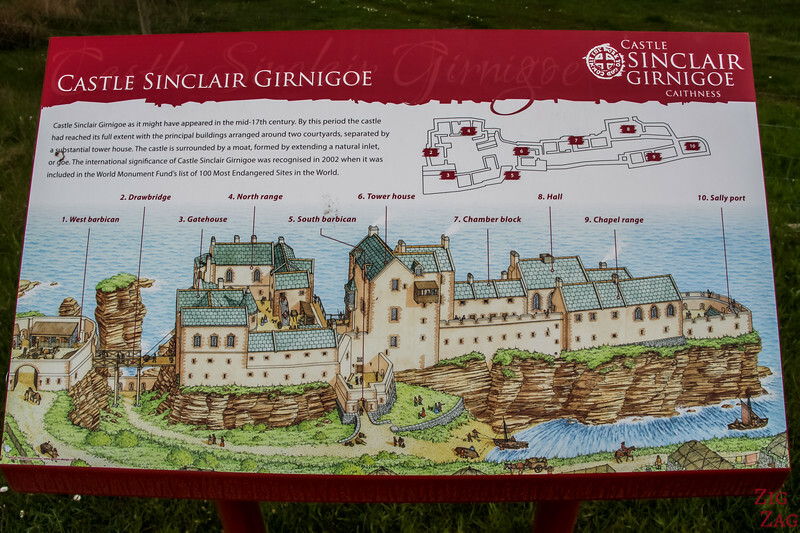 Later a big battle between Glenorchy and Sinclairs left the castle ruined. 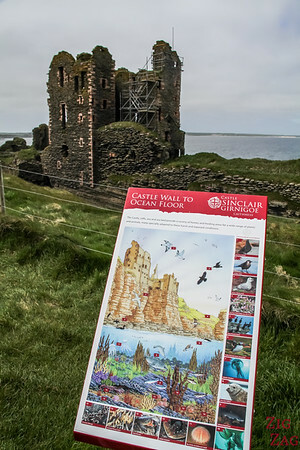 The Clan Sinclair trust is trying to investigate and consolidate the site.​ Learn more about the history of the castle on their website. This is what the castle used to look like. 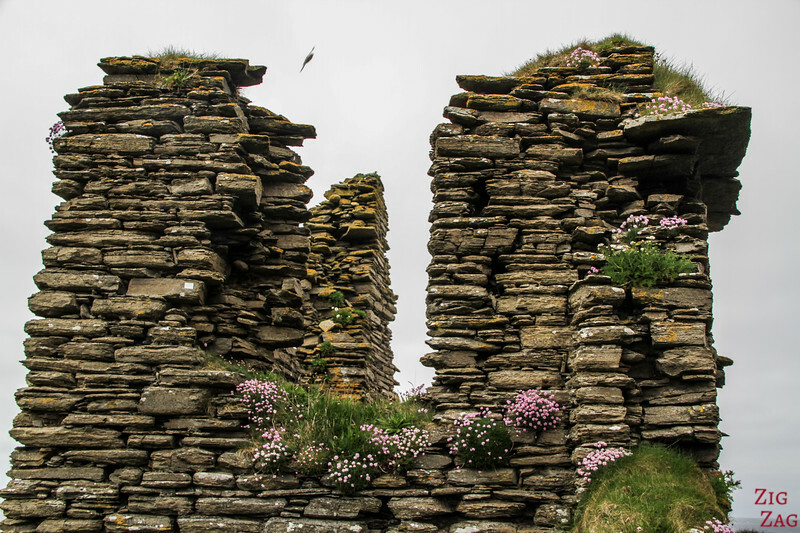 See how it was build on the cliff / promontory. Below is a picture of the track to get to the castle. 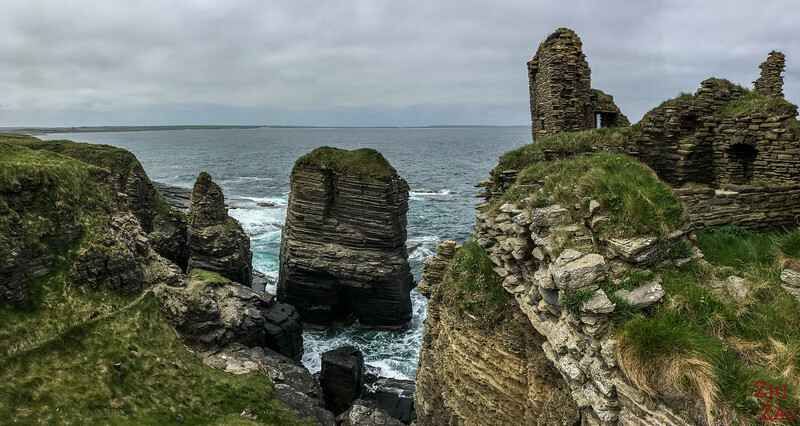 A 5 to 10 min easy flat walk takes you to the cliffs. 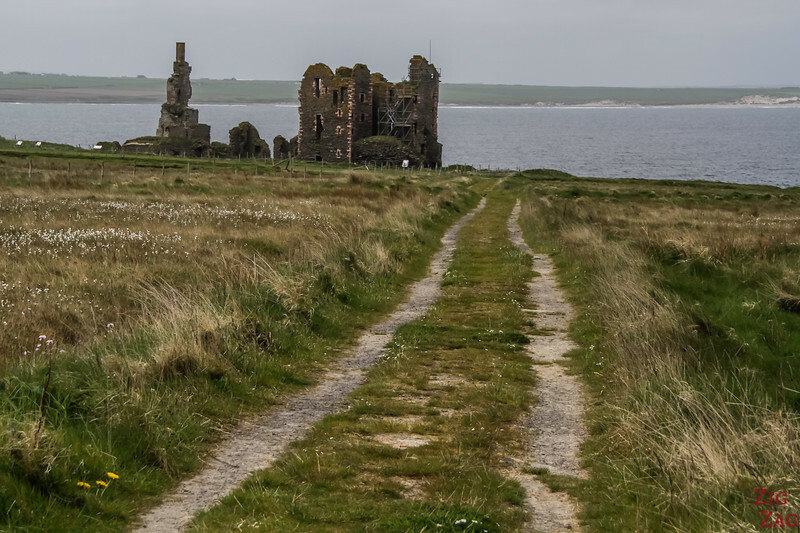 In the same area but South of Wick is the Old Wick Castle​. After research the Old Wick had less ruins remaining. 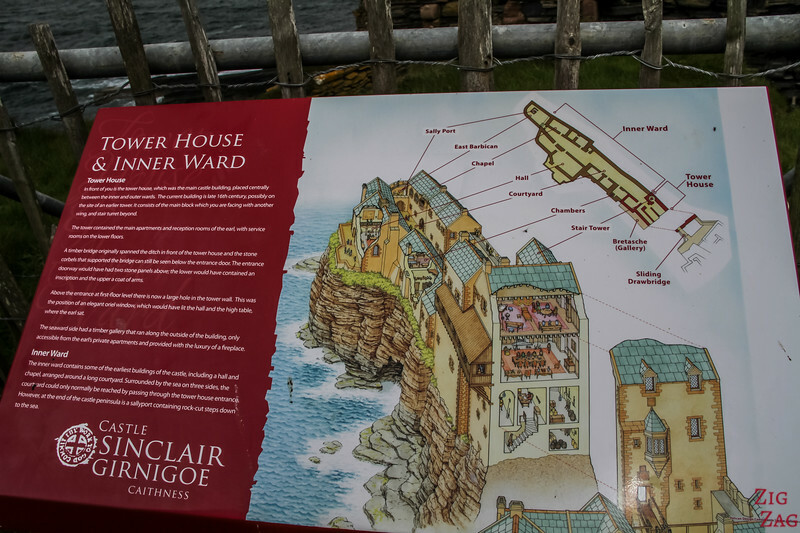 This is why I chose to visit the Castle Sinclair Girnigoe. After a little bit of walking you finally see some of the ruins. And once you approach you discover how they are set up on the cliffs. It is quite impressive. The site is full of signs with explanation about the architecture, the flaura and fauna. 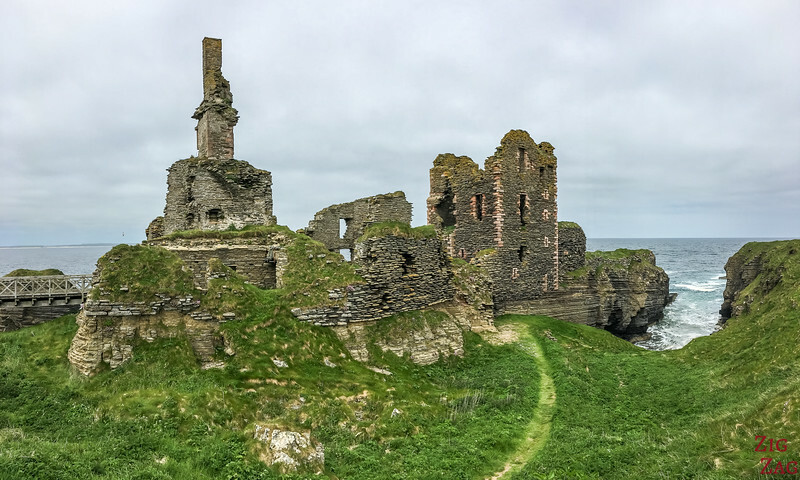 He is a global view of what remain of the castle. 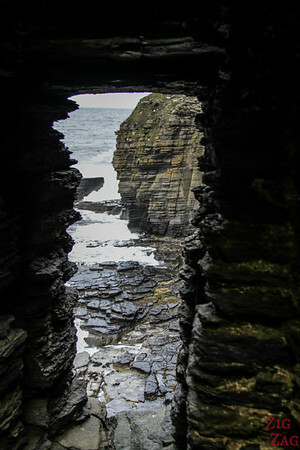 Between war and erosion it has lost its grandiose. But it must have been quite a sight. I love this shot as you can see where it was built. 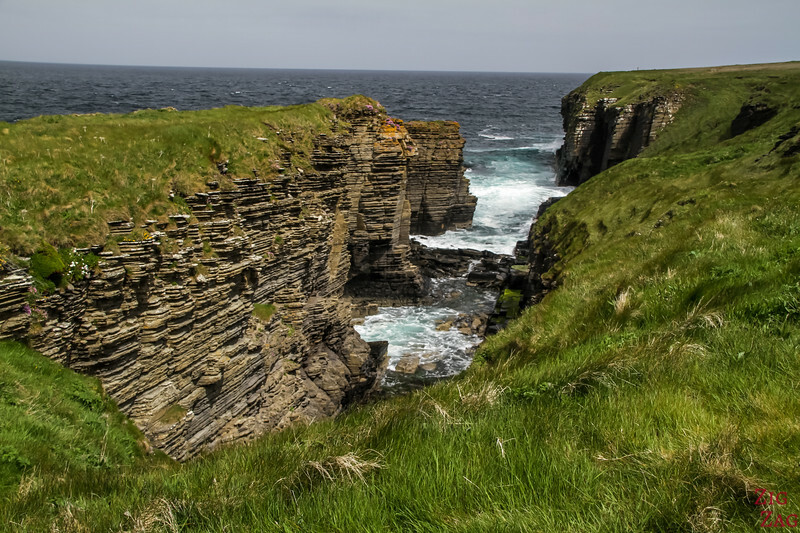 The cliffs have strange shape has the water carved long tongue of rocks. 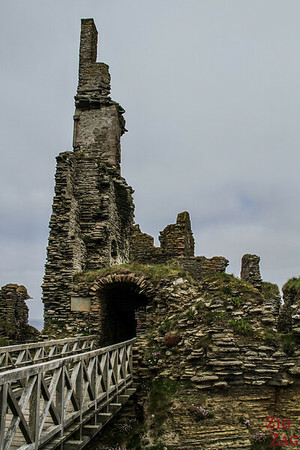 A small portion of the ruins can be entered as deemed safe. A Bridge takes you to the left side of the castle. 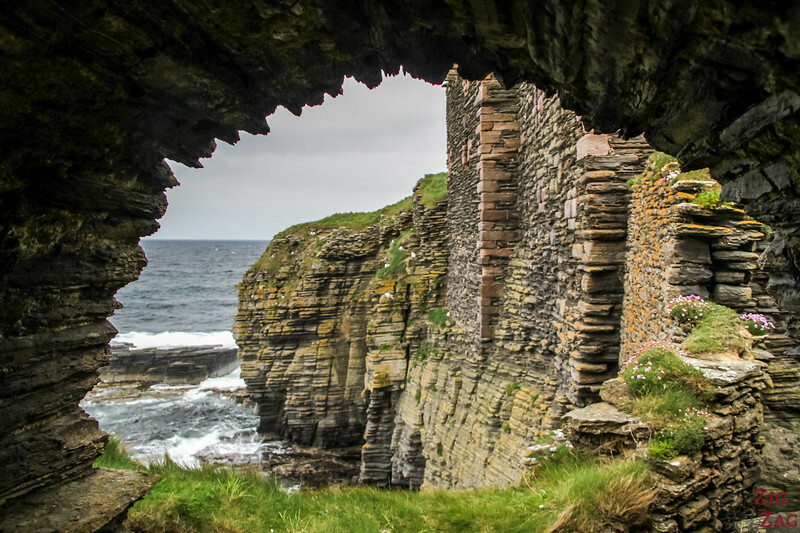 You can see up close how it was built with layers of rock that remind you of the cliffs.